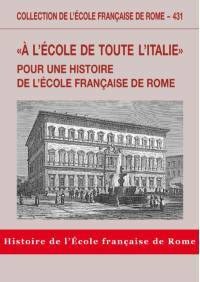 The École française de Rome was founded between 1873 and 1875. The idea for the École was first conceived by a group of scholars who were involved in the renewal of French higher education after the French defeat in the Franco-Prussian War. Their ambition was to reaffirm the strength of French scholarship within the new European balance of power by creating an institution that would provide effective support for academic research. The École began life between 1873 and 1875 as an archaeological training school attached to its older counterpart in Greece, the École française d’Athènes, which had already been in operation since 1846. It was originally conceived of as a waystation in Rome for young scholars, called “members” (membres), who would take a year-long course in archaeology in Rome to ensure that they would be fully trained when they arrived at the excavation sites in Greece the following year. 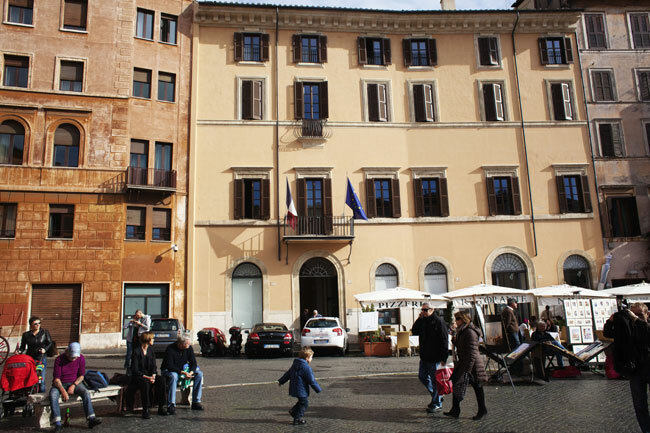 The École became a fully independent institution in 1875 and took up permanent residence in the Palazzo Farnese, sharing the building with the French Embassy to Italy. SHistorical research became one of the main research areas of the École alongside archaeology after the appointment of the first director of the École, Auguste Geoffroy, who was trained as a specialist in modern history. The special place of historical research, and in particular research on the history of the Church, within the activities of the École is explained by the richness of the archives of the then-newly reunified Italian state and the Holy See, which houses an inexhaustible stock of primary sources dealing with all parts of the world where Roman Catholicism has had an influence. Archaeology remained an active area of research throughout the early years of the École, however. Because of the special constitutive role played by cultural heritage in Italian reunification, Italy at the time refused to issue excavation permits to foreign governments, preferring to maintain sole responsibility for research into its own past. The earliest excavations by members of the École in Italy, such as the excavations of Stéphane Gsell at Vulci on the property of the princes Torlonia, therefore took place on private land; members of the École instead undertook projects for the most part in the countries of the Maghreb. Large-scale French-led archaeological sites in Italy were opened only after the Second World War: at Megara Hyblaea in Sicily, at Bolsena and Mursarna in Latium, on the Pincio and at Vigna Barberini in Rome, and elsewhere. Up through the 1950s the École remained a small and relatively closed institution despite the important role it played in French and Italian intellectual circles. It admitted only a few handpicked new members each year, eight per year at the beginning of the sixties, with interests ranging from antiquity to the early modern period. The late sixties and seventies, by contrast, marked a major period of change for the École. During the directorship of Pierre Boyancé the number of members increased considerably. Under director Georges Vallet the École first acquired and renovated a building on the Piazza Navona to accommodate large conferences and to house researchers for short-term stays, then put in place in 1974 a series of scholarships to fund month-long research visits, making the École accessible to a much larger number of scholars than before. Legislation enacted in 1974 opened the École for the first time to scholars focusing on the modern period by creating three research “sections” at the École for antiquity, the Middle Ages, and the early modern and modern periods respectively, each led by its own directeur des études. Starting in the 1990s, the École expanded its areas of research to include the non-historical social sciences. In 1999 it increased the number of members to eighteen and took over management responsibility from the French Ministry of Foreign Affairs for the Centre Jean Bérard in Naples, a centre for research on southern Italy focusing primarily on archaeology. The École administers the centre jointly with the French National Centre for Scientific Research, thus reinforcing the already strong ties between the two institutions. In 2011, a new ministerial decree granted autonomy to all five French overseas research schools and established a framework for managing all the schools as a unified network. "Un intellectuel catholique sous la IIIe République : Georges Goyau (1869-1939)", Rome, 2007, J. Grondeux, (Coll. EFR, 381). Translation from French to English by William P. Sullivan (2017/04/19).